The United States Air Force Memorial honors the service of the personnel of the United States Air Force and its predecessors. The Memorial is located in Arlington, Virginia, on the grounds of Fort Myer near The Pentagon and Arlington National Cemetery, at the intersection of Columbia Pike and South Joyce Street. It was the last project of American architect James Ingo Freed (known for the design of the United States Holocaust Memorial Museum) with the firm Pei Cobb Freed & Partners for the United States Air Force Memorial Foundation. In January 1992, the Air Force Memorial Foundation was incorporated to pursue the development of a memorial that would honor the people in the United States Air Force. In December 1993, President William Clinton signed Pub.L. 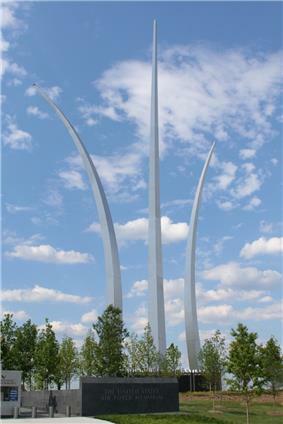 103–163 authorizing the Air Force Memorial. In 1994, the National Capital Memorial Advisory Commission approved a site adjacent to Marshall Drive and State Route 110, down the hill from the Netherlands Carillon, known as Arlington Ridge. Fundraising and detailed designs began. Because the site was near the Marine Corps War Memorial, which is just north of the Carillon, various Marine groups were briefed on the plans without voicing objections. However, on 30 July 1997, Congressman Gerald B.H. Solomon (R-NY), a Marine veteran, introduced a bill to prohibit the construction of any monument, memorial or other structure "within view" of the Marine Corps War Memorial. The Air Force Association organized support for the memorial on behalf of its membership and Air Force veterans, and the issue became a polarizing one between the services. On 28 December 2001, President Department of Defense to make available to the Air Force Memorial Foundation up to 3 acres (12,000 m2) of the Naval Annex property for use as the location for the memorial. Formal groundbreaking of the site was held in September 2004. Construction of the spires began in February 2006 and was completed in seven months. The memorial was dedicated on 14 October 2006, with approximately 30,000 persons attending. The keynote address was delivered by President Bush, a former F-102 Delta Dagger pilot with the Texas Air National Guard. The first official ceremony at the memorial was held the next day when Secretary of the Air Force Michael Wynne laid beneath the spires a memorial wreath for fallen airmen. The first non-military group to perform at the memorial was the Timpview High School Marching Band in April 2008. During the summer, The United States Air Force Band presents free concerts on Friday evenings. "To all who have climbed sunward and chased the shouting wind, America stops to say: your service and your sacrifice will be remembered forever, and honored in this place by the citizens of a free and grateful nation." —President George W. Bush at acceptance ceremony. The Air Force Memorial Foundation, the organization created to plan for and build the Memorial, continues today as an affiliate of the Air Force Association. The three memorial spires range from 201 feet (61 m) to 270 feet (82 m) high and appear to be soaring; its array of stainless steel arcs against the sky evoke the image of "contrails of the Air Force Thunderbirds as they peel back in a precision 'bomb burst' maneuver." 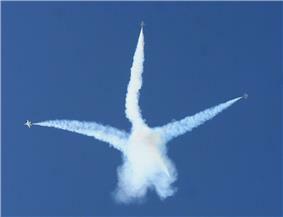 Only three of the four contrails are depicted, at 120 degrees from each other, as the absent fourth suggests the missing man formation traditionally used at Air Force funeral fly-overs. The spire structure consists of stainless steel plates with high-strength concrete filling the lower 2/3 of each spire. The upper third is hollow stainless steel. At the transition between concrete and hollow steel portions, dampers provide aerodynamic stability and dissipate wind sway energy. Each damper consists of a lead ball weighing about a ton that is allowed to roll inside a steel box. The structural design of the spires was completed by the Arup engineering consultancy. The pedestrian approach to the spires is from the west. South of the approach, before the inscription wall, stand four 8-foot-tall (2.4 m) bronze statues of the Memorial's Honor Guard, sculpted by Zenos Frudakis. To the north, this is linked by a stone plaza to the glass contemplation wall, a free-standing glass panel with the images of four F-16s flying in a Missing man formation engraved on both sides of the 5-ply panel. Except for the information kiosks outside the administration building, it is the only part of the memorial that depicts aircraft. The north inscription wall is visible through it. The two inscription walls are located at each end of the central lawn. The walls are 56 feet (17 m) in length, 10 feet (3.0 m) in height and one foot thick. Both walls are made of polished, highly-reflective monolithic Jet Mist granite and both include a two and a half inch outer inscription panel made from Absolute Black granite. The north wall bears the names of Air Force recipients of the Medal of Honor, and the south wall bears inspirational quotations regarding core values, particularly the Air Force's three core values: "integrity first, service before self, and excellence in all we do". In addition to hosting over 275,000 visitors throughout the year, the Air Force Memorial is the scene for more than 250 ceremonies, special events, wreath laying, tours, weddings, and United States Air Force Band Concerts throughout the year. ^ "About the Memorial". Air Force Memorial Foundation. Retrieved 17 September 2008. ^ "Air Force Memorial Foundation". Airforcememorial.org. Retrieved 15 February 2012. President Bush dedicates Air Force Memorial Saturday, 14 October 2006, quoting John Gillespie Magee, Jr.'s poem "High Flight". Photo Album of Zenos Frudakis on Flikr Photo Service – " National Air Force Memorial Honor Guard sculpture, Arlington National Cemetery in Washington, D.C. by Zenos Frudakis"